Having picked through links that came to a dead end in a fascinating paper on the variety of technologies and tactics being used by museums in relation to mobile learning I started to see and read more and more about the use of QR codes (those matrix two-dimensional bar codes you use with a smartphone) and NFC ‘Near Field Communication‘ which is becoming an industry in its own right. Having been kept awake at night about a need for ‘constructing knowledge’ rather than being fed it I knew that visitors, students especially, need to engage with their surroundings by somehow seeking and constructing their own views. Without QR and NFC the simplest expression of this is taking notes, and or photographs of exhibits – not just selfies with a mummy or your mates. Possibly doing bits of video. 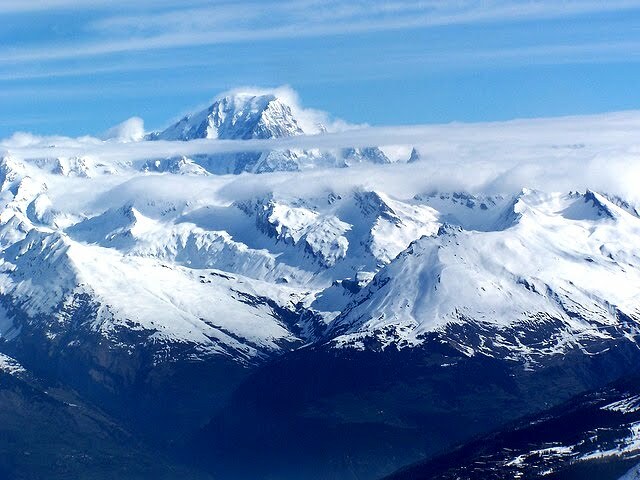 And from these images cutting/editing and pasting a few entries in a blog, Prezi or SlideShare. QR and NFC feed the visitor controlled and curated bite-size nuggets, so more than just a snap shot, you can have audio and video files, as well as more images and text. Fig.2. 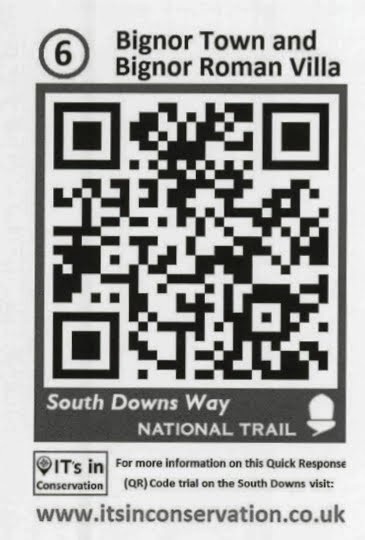 South Downs Way QR Code. Successful trials mean that these have spread. Funny I’ve not noticed them living in Lewes and walking the dog most days on the South Downs. I’ll take a look. NFCs have been used extensively, for 90 exhibits, at the Museum of London – so a visit is required. Though I won’t be ditching my iPhone. Apple does not support NFC believing that the technology is still in its infancy … like Flash, like Betamax and VHS, and all that stuff, a battle will be fought over the NFC benchmark. So 60% penetration of smartphones in the population … most of all of which can use a QR code, but less using a early version of NFCs. 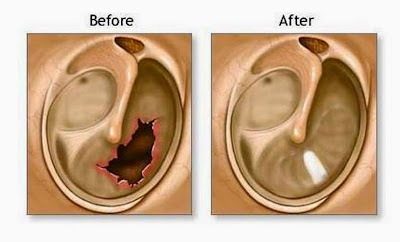 My experience? Last year a visit to the Design Museum I found the ‘Visualizing the mind’ exhibition littered with QR codes. They didn’t work. Just as well they had ample computers. How often do organisations jump on the IT bandwagon only for a couple of wheels to fall off further down the road? Meanwhile I’m off to walk the dog .. then using a trip to see Gravity at the Odeon Leicester Square with my kids to include an educational tour to the Museum of London (always handy to have a teenager around when using mobile technology). ‘REPORTING RESEARCH’ 2013, Interpretation Journal, 18, 1, pp. 4-7, Academic Search Complete, EBSCOhost, viewed 10 November 2013. Inclusion/Case Study : John, an engineering Postgrad PhD student with Cerebral Palsy. Innovation/demo: QStream 90 day trial. How a MOOC will spot the genius. He or she is riding a bike in a favela in Brazil. October 1, 2013 11:16 am / 1 Comment on How a MOOC will spot the genius. He or she is riding a bike in a favela in Brazil. What has changed in learning each time a transformative tool or technology has come along from a) written language b) papyrus c) codex d) printing and e) the Internet? A neuroscientist will say that the human brain hasn’t changed one jot – its innate capacity to learn and to do so at certain developmental stages remains the same. Struggling to see what is new, believing that our latent motivations, drives and inclinations to learn as individuals are as unique to each of us as it has always been I see one change only – the numbers, whether as a percentage in a population or as a gross figure – literacy could only expand as the printed word got into the hands of more people. The Internet will in due course help put primary, secondary and tertiary education into the hands of the disenfranchised. What has been the frequency of genius revealing itself over the last thousand years? Even accounting for the billions to chose from in the 21st century compared to the 15th, or 1st, won’t exposure too and access to ‘an education’ by billions give genius a chance to develop and show itself like never before?